This charge base offers a sleek and unique design that is impressive and functional. The station let’s you know when it’s charging via the connection by appearing in red light (charging) and green (fully charged). It is powered by the included AC power cord. 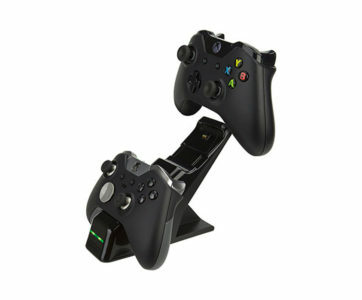 Keep those controllers charged and get back in the game with the fully licensed Energizer Power & Play Charging System for the Xbox One by PDP.